Here it is, my first book of the year…. 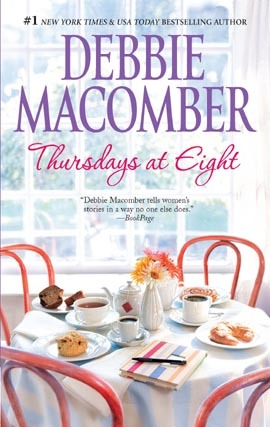 “Thursdays at Eight” by Debbie Macomber. This was an audio book that was a mere 8 CD’s long, so it only took me a couple of trips in the car to finish it. The audio book I “read” prior to this one was a complicated, long novel by Philippa Gregory and I was ready for something light and easy. Well, light and easy was what I got. Ms Macomber’s books usually fall into that category… in fact this was really a little too light and easy – particularly too easy to guess the path the novel was going to take. It was about four women who met every Thursday morning at a coffee shop to discuss their lives. Of course we get to know each woman and the particular trials each one faces. This book was simply okay. It managed to keep my interest, but only because I had nothing else to listen to. I have read other books by this author and enjoyed them much more. This one was certainly forgettable. This entry was posted in Books 2011 and tagged book review, books. Bookmark the permalink.